City of New York archives, via 80s.NYC. No commercial reuse. If it’s possible to get mugged by a photo, the photo in question is in this collection of streetview NYC photos in the 80s. 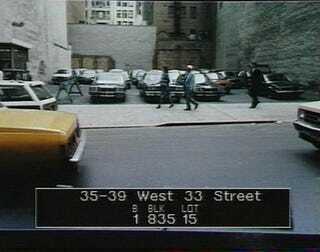 The City of New York took pictures of every building in the five boroughs, and digitized them (to laserdisc) in the mid-80s. The City of New York has put the low-res ones online, and 80s.NYC has a street view interface where you can view the pictures of buildings on a particular block. Time for some Cool Car in a Particular 80s Town?